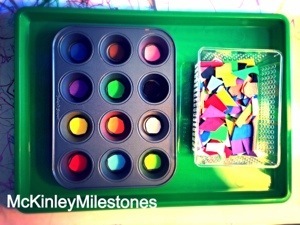 This is a fun activity to do with your toddler! This exercise helped McKinley learn her colors and it kept her entertained for a solid 20 minutes. 1) Take cupcake tin and glue down, or stick on foam color to the bottom. 2) Choose a different color for each cupcake space. 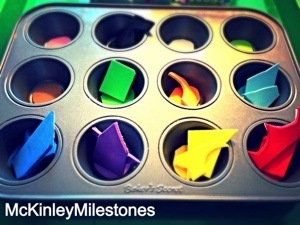 3) Collect different object small enough to fit into cupcake spaces, or cut out different shapes of the colored foam. 4) Place objects in a separate container. 5) Always do a demonstration first. 6) Set container beside cupcake tin and have them sort the colors!